The largest, most robust CraftMaster Hobby and Drawing Station yet, the CraftMaster III features a split top for ultimate versatility with a tilt-adjustable 30" × 42" (76 cm × 107 cm) section and a 30" × 18" (76 cm × 46 cm) fixed section. The total work surface measures 30" × 60" (76 cm × 152 cm). The unit contains four storage drawers, each measuring 9"H × 7"W × 10"D (23 cm × 18 cm × 25 cm), and a built-in storage shelf measuring 40"L × 11"D (102 cm × 28 cm) with backstop. 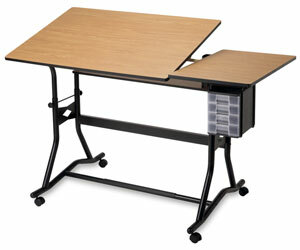 A one-hand tilt mechanism adjusts the tabletop from 0–30°. The unit adjusts from 35" to 39½" (89 cm to 100 cm) high in the horizontal position with casters, and 33½" to 38" (85 cm to 97 cm) high with floor glides (both are included). The unit features sturdy tubular 1½" (4 cm) diameter black powder-coated steel construction, a crossbar footrest, a pencil ledge, and an instrument tray. The work surface is Cherry woodgrain. This unit requires minimal assembly.